Stitchin’ and Pullin’: A Gee’s Bend Quilt, by Newberry and Caldecott Honor Book author Patricia C. McKissack, is the warm and cozy tale of a sisterhood of quilters, the beautiful quilts they produce, and the unbreakable bonds they form that only women can understand. Told through the eyes of a pampered baby playing underneath the busy stitching table, the reader gets a child’s eye-view of the wonder of watching mothers, sisters, aunts, grandma’s and friends stitching and socializing, singing and crying, laughing and smiling. Baby Girl, the MC, listens to all the heart-warming stories of slavery and freedom, peace and hope, family and togetherness. 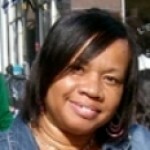 She also watches tnimble, nut-brown fingers weave history and unforgettable memories into every stitch of cloth. When at last she is old enough to sit at the table and add her own careful stitches to the Gee’s Bend Quilts, she carries on the quilting tradition by weaving her own special memories into carefully-chosen scraps of cloth. 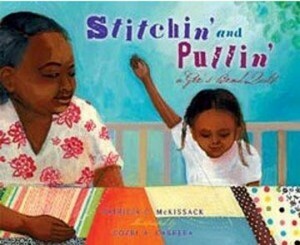 Stitchin’ and Pullin’ is a wonderful addition to McKissack’s 100+ books about the African American experience. Its pages are beautifully illustrated in a patchwork of warm and inviting colors, and should be a pleasure for readers of all ages.